Do you ever see something in RTW and know you can make it? I do that quite a bit but there is times there is a but and with Simplicity 1499 there was a big but! Fabric...... sometimes it is all about the fabric and finding the right fabric. 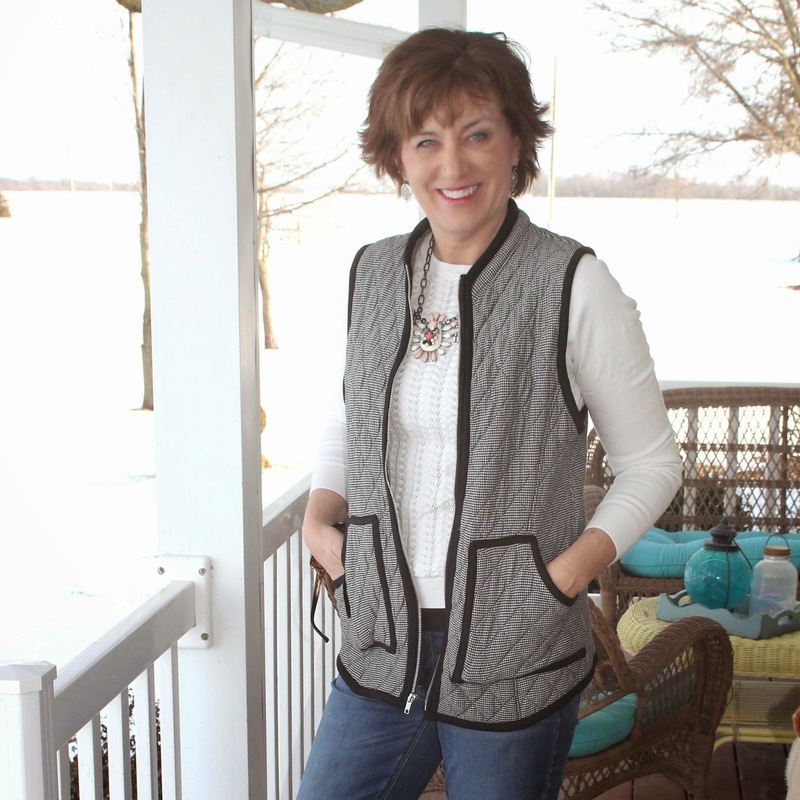 I wanted to make this vest all year, after all I featured it on a Fashion Friday Inspiration. 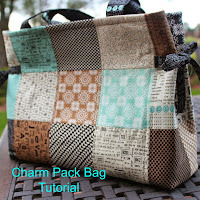 Enter some fabric shopping online while television watching and I found this wonderful quilted fabric from Emma One Sock. I could not hit the order button fast enough, what if someone or several someones had the same idea as me? This fabric had to come to my house! 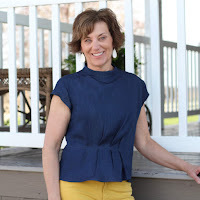 Just look at Pinterest to see the RTW JCrew inspiration and be inspired by the trendy fun and versatility This vest quickly sold out at the beginning of the season. I did in fact order one in October during a fabulous sale, only to get a size too big. Yep, you guessed it by the time I tried to order the correct size, it was sold out. 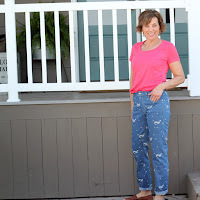 No worries, we in the sewing community can make whatever we want! And beware I so love this vest, you are going to see lots and lots of pictures of this vest on this blog post Sometimes the photos are the tricky part, especially in a 16 degree day with strong winds. Tame the hair now. I went with a size 12 from the pattern, it would be a bit big according the the finished measurements on the pattern piece but I thought with bulky sweaters I would want it a bit bigger. I ended up taking it up quite a bit on the front princess seam from the bust to the underarm seam. The amount was about 1". 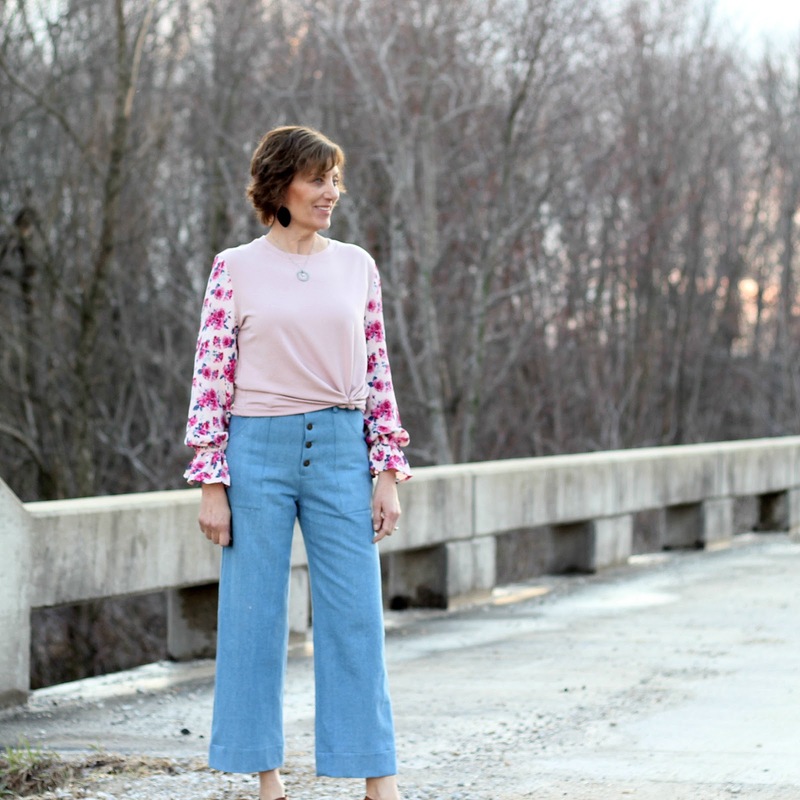 This fabric has a bit of a stretch but it is warm and so comfy, plus it washed beautifully. 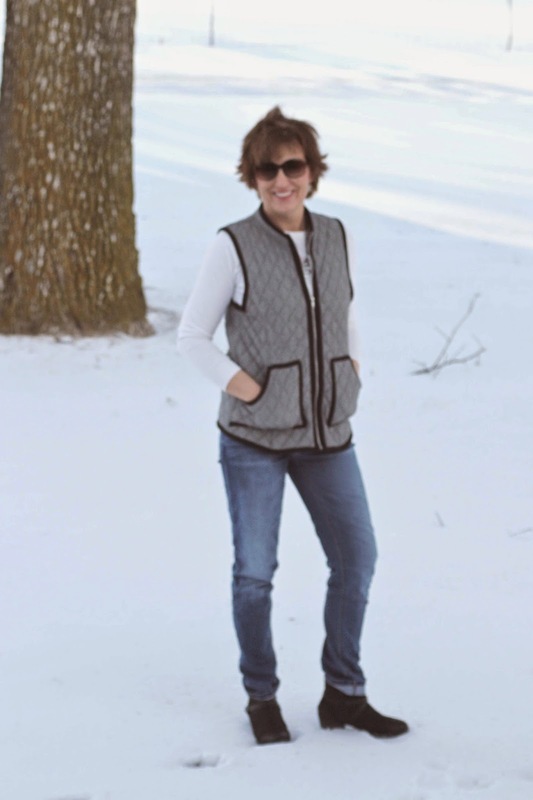 This exact fabric is no longer in stock at but here is the outerwear section at Emma Once Sock and a few quilted options. Let's talk construction. I used an 80 universal needle but I did change it during the construction, I felt it dulled through all the layers. 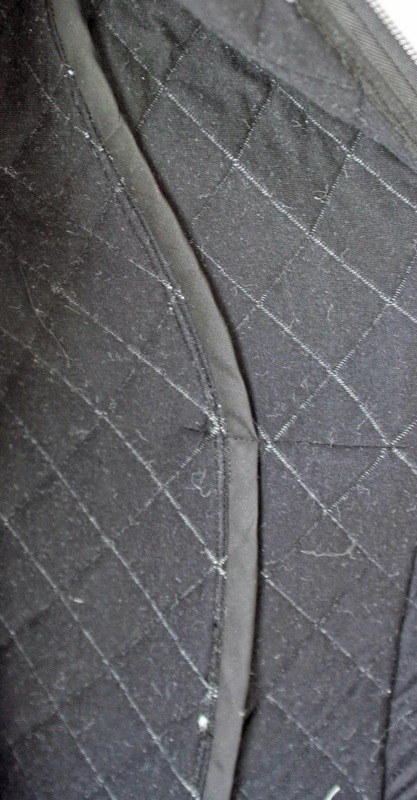 The quilted insides of the fabric did get a bit messy and I controlled it by serging the edges after using my regular sewing machine for construction. I really thought the serging would be enough of a finish but truly it was just more messy. I went with a bias binding finish, encasing both all of the seam allowance in one binding. I then pressed it in one direction and topstitched the seam in place from the right side. This really made for a nice inside and a bit of detail on the outside. 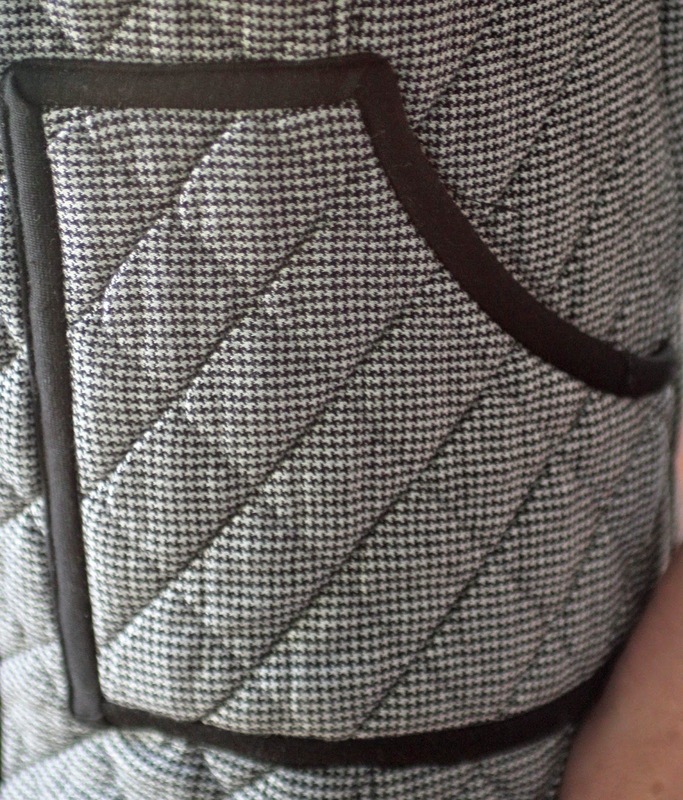 The trim is block ponte knit, I wanted something soft like the vest and the ponte was perfect for the trim. I cut my pieces 2" wide and the width of the fabric for the length. I stitched it to the right side, folded it over the raw edge and pinned in place. After pinning, I stitched in the ditch to securing the binding. Now for the raw edge, it is a knit and the best part, it is not going to fray. I used a trick from my old polar fleece sewing days, using a pair of bent handle scissors is the key. I would slightly pull on the extra binding on the back side at the same time trimming it close to the stitching. Yes, it is a bit tricky but go slowly and it can be done. When you use this method, it really keeps the fabric even and gives you a nice clean finish. One thing I would do the next time is cut the binding about 2-1/2" wide, it was a bit tight when going through areas with multiple layers. For example the princess seams, with the seam allowance and the bias binding seam finish. The pattern calls for a 20" zipper but is was too short for my vest. I went to Joann's today and bought a 24" all they had and was planning to shorten it. I did go look at a couple RTW vests in my closet and those had the zipper from the bottom of the vest to the top of the collar. 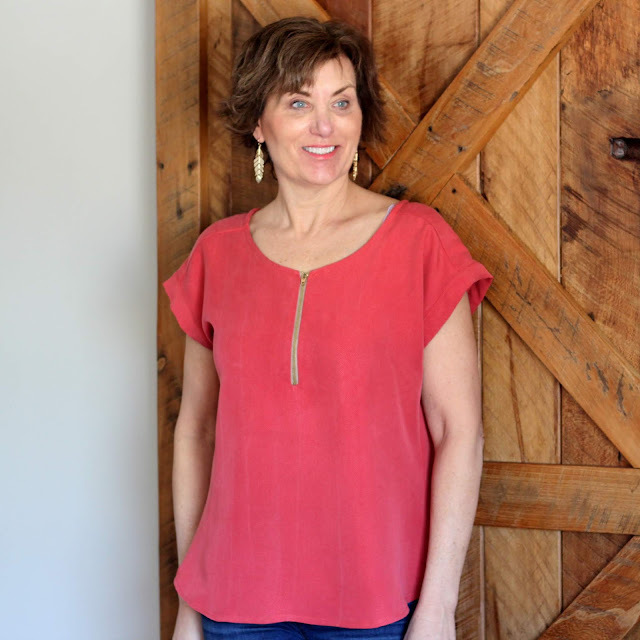 The Simplicity pattern has you stop at the collar. Well, the 24" was absolutely perfect length to make my vest zipper just like my RTW ones. I do think the armholes are a bit deep in this pattern so next time I am raising them one inch. It is easier to cut some off if I adjusted too much. I am not going to let this bother me in the least. Meredith was hanging out in the sewing room with me as I finished this vest up today. The first thing she said when I zipped it up was "wow, that is so good." My sentiments exactly Not many times do I find such a perfect fabric and pattern match to recreate something from RTW inspiration. This pattern and fabric are the perfect match and makes this cold, snowy weather easier to take. Now back to the zipper, I did not want any stretching when sewing this zipper in place. Marking the zipper into fourths and the front of my vest into fourths, eliminated the stretching. I pinned these marks and double checked each side before stitching into place. One other thing I did, was sew each side of the zipper the same direction. One thing on the pockets, I did have to unsew the left side and move the front of the pocket up about 1/4" to make the pockets even after installing the zipper. I really spent quite a bit of time pinning the pockets in place and measuring but there were still off just a touch. A solution would be to baste the pockets into place, install the zipper and adjust pockets if necessary. After any adjustments stitch them permanently into place. Can I say love again about this vest? I am very, very proud of the end result and will wear this with pride. Outstanding job on this vest! Thanks for all the sewing details . I always learn so much from you ! 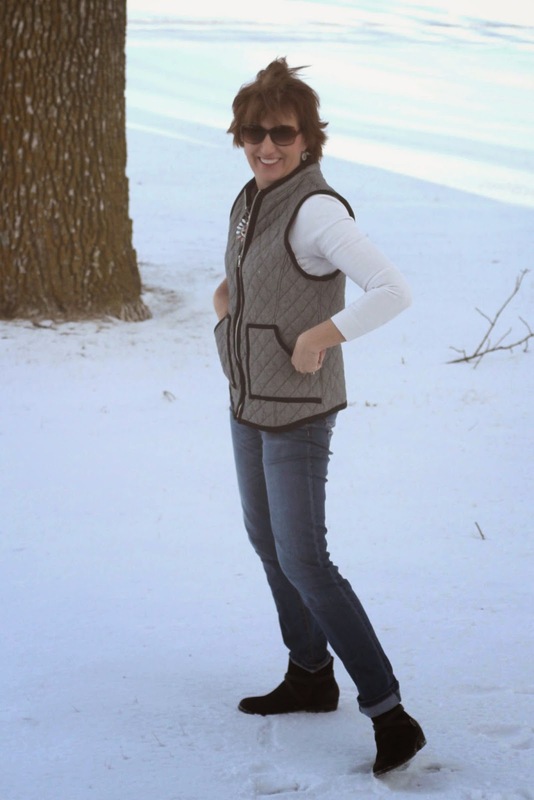 Great vest! 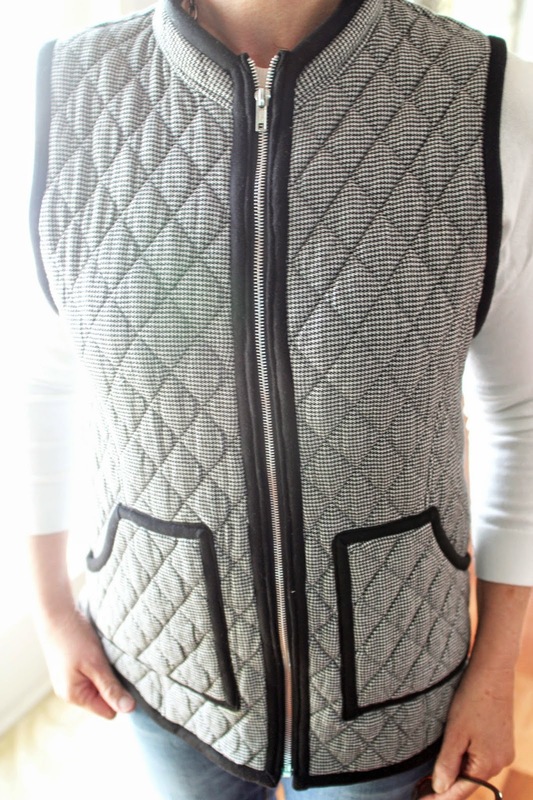 I love this quilted look/style in a winter vest. Thanks, Coco, I really like the style, too. This looks amazing. 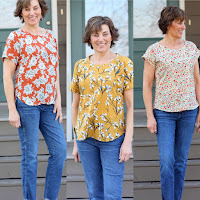 I really enjoy when you tell how you tackled the sewing challenges during the process. Thanks, Dharma, I am getting better about taking pictures with my phone during the process. Wow Lori! This is awesome! 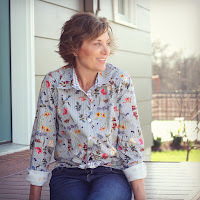 I just love EOS fabrics! If I wasn't on a 'fabric diet' I'd head over there right now! TFS! Thanks, Sue, I just put in another order with EOS. I don't have much of a stash but of late, I have been accumulating some nice pieces from different sources. Oh my!!! 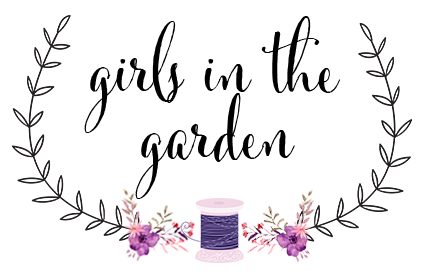 This is on my sewing queue for this year! Thanks for reviewing and for all the tips! I can see why you like it!! It's amazing!!! 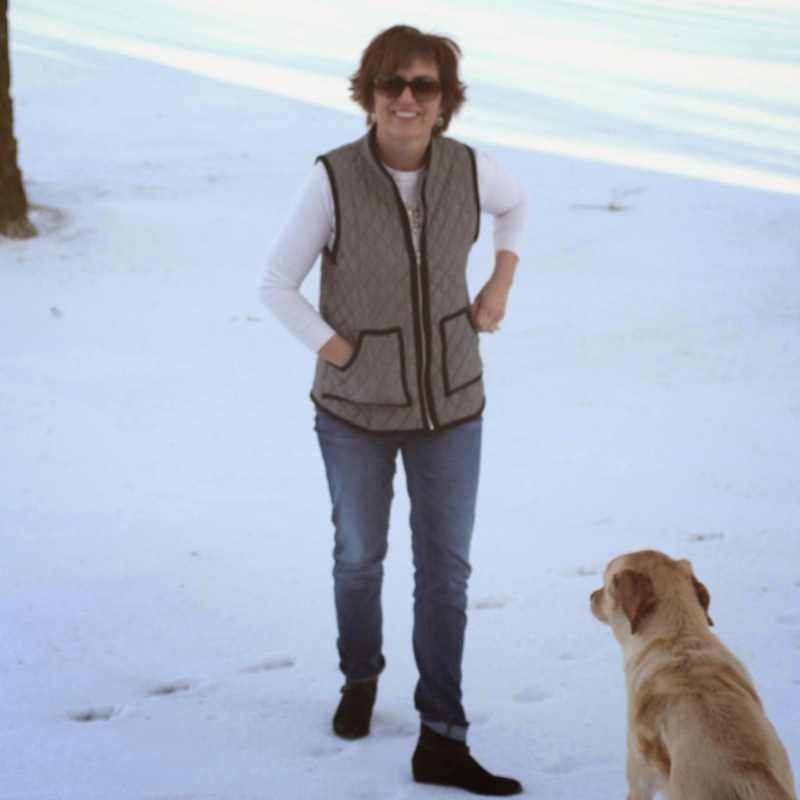 Thank you, Paulina, I love this vest and was so thrilled when Simplicity released a pattern. Beautiful and right on trend! You will get so much wear out of a great vest like that. Thanks, Anna, I think it will be a favorite! 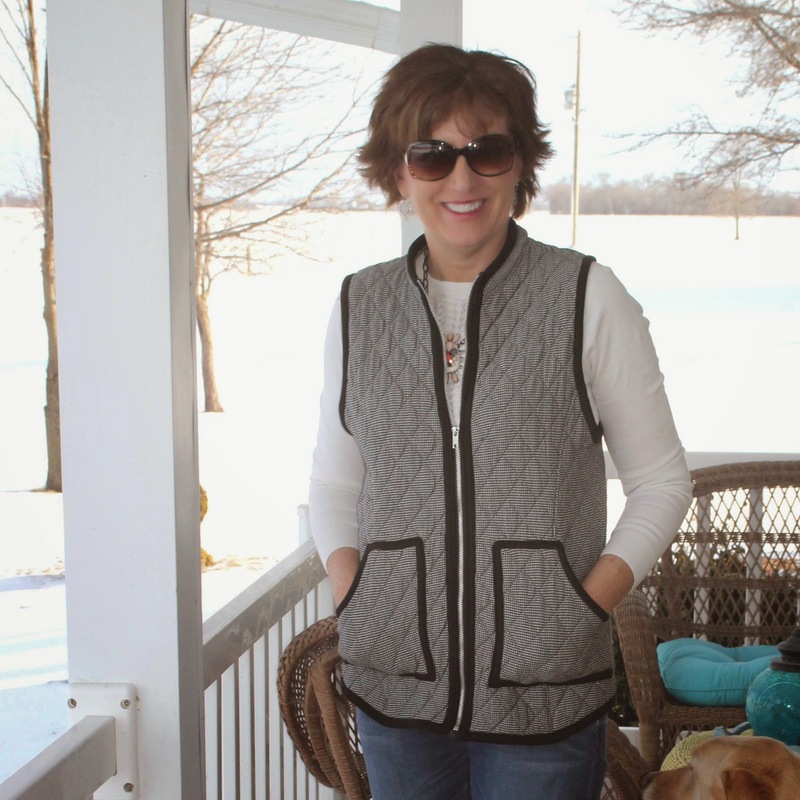 Fantastic vest, Lori, I love it too! Lori, just bought this pattern yesterday @ the Hancock's 99¢ sale. Headed up to the chilly north soon, and thought this would be great to have. Thanks for your thorough review and tips, they will come in so handy when I make this tomorrow! It's a fantastic vest! Love it!! Wow, that is good. (To repeat something that your wise daughter said) I love it! Thanks for the construction tips. 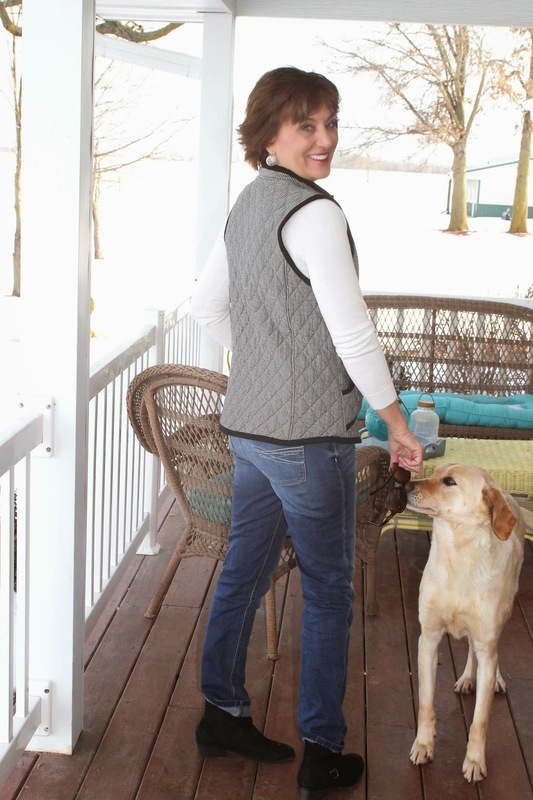 Cute vest! Nice job on the binding and zipper- you make it look easy, and I know how tricky those things can be! Thanks, Ann, that is always a tricky part. 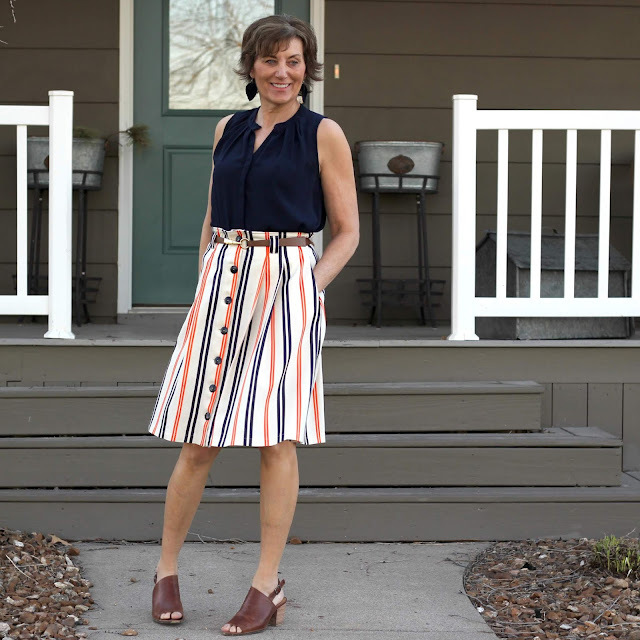 So love it when I find just the right fabric to recreate a rtw garment I have a crush on. This is a great success! It is the best Noelle. Thanks so much. Beautiful! 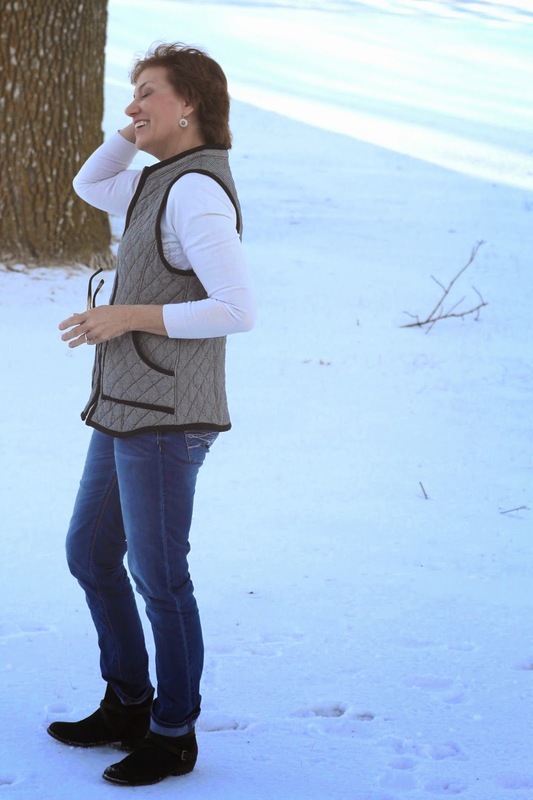 I always love a warm vest and have been thinking about this pattern, thanks for your thorough review! 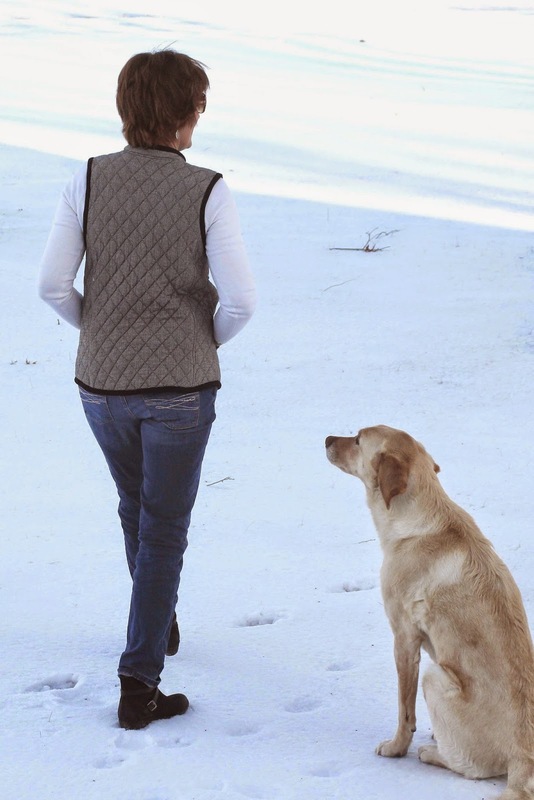 I'll be using your recommendation for the ponte trim as I make this vest today on a Polartec 200. Your review and suggestions have been helpful. I'll let you know how it goes.